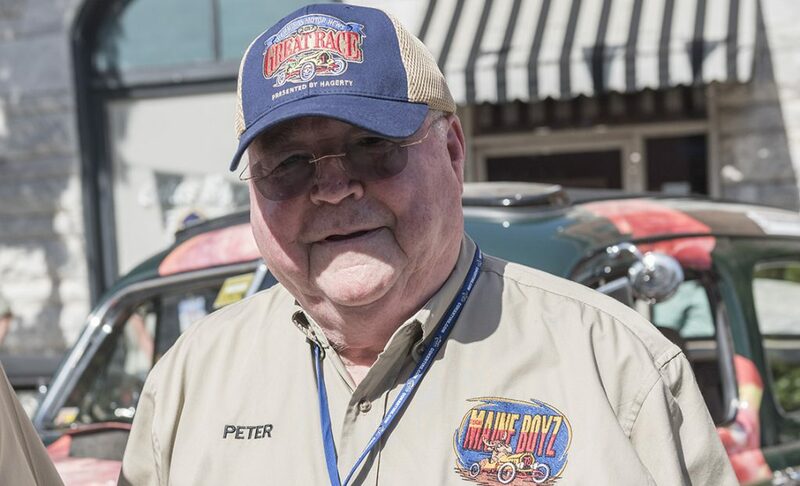 Great Race director Jeff Stumb was in Buffalo, New York this week to announce the 2018 Hemmings Motor News Great Race presented by Hagerty will start in that city at the Pierce Arrow Museum. The Great Race had an overnight stop at the museum in 2012 but it will be the first time it has started in Buffalo. The race will start Saturday, June 23, 2018, and finish in Nova Scotia, Canada, on Sunday, July 1. In a few weeks the people on the 2017 Great Race waiting list will have an opportunity to secure a guaranteed spot in the 2018 event and participants in this summer’s race will be able to enter in July. New York natives Howard and Doug Sharp brought their two winning Great Race cars — a 1911 Velie which won the 2011 event and a 1916 Hudson which won the 2015 race — to the announcement. See the press release below for additional information. Buffalo, New York, will host the start of the 2018 Hemmings Motor News Great Race presented by Hagerty Saturday, June 23, race organizers have announced. The Great Race, the worlds premiere old car rally, will bring 120 of the worlds finest antique automobiles to town for the $150,000 event. 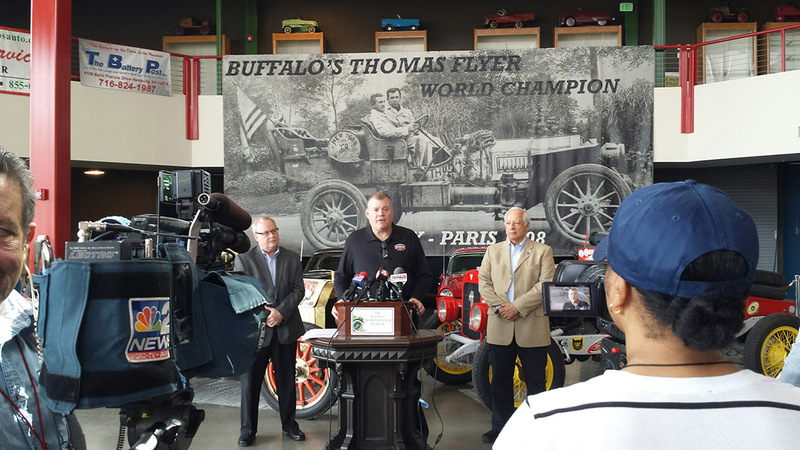 We are pleased to be working with Jim Sandoro and the Buffalo Transportation Pierce Arrow Museum to bring the Great Race to Buffalo for the start in 2018, event director Jeff Stumb said. Teams and cars from Japan, England, Germany, Canada and every corner of the United States will converge in western New York with vintage automobiles dating back as far as 1916. There are more than 450 people just in our entourage from all around the world, Stumb said. And they will be spending four and five days in Buffalo before the start of the race getting ready for their 9-day, 2,300-mile adventure. The race will finish July 1 in Halifax, Nova Scotia, on the banks of the Atlantic Ocean as part of the citys Canada Day festivities. Along the route, competitors will travel two and a half days eastward through the state of New York before zig-zagging around New England. The last few days of the event will travel through the Canadian provinces of New Brunswick and Prince Edward Island before finishing in Nova Scotia. It will be the first time the Great Race has ever taken place in the Atlantic Time Zone. Lunch and overnight cities along the 2018 route are still being determined and will be announced this summer. Cars built in 1972 and earlier are eligible, with most entries having been manufactured before World War II. 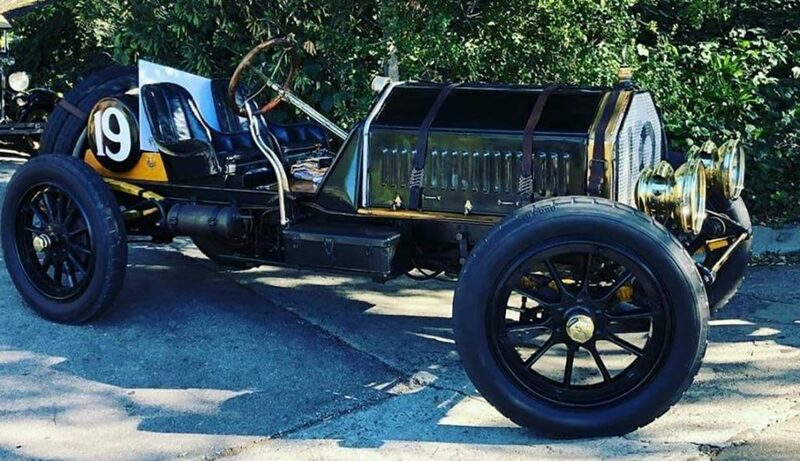 In the 2016 Great Race a 1916 Hudson Indy Racer won the event from California to Illinois. 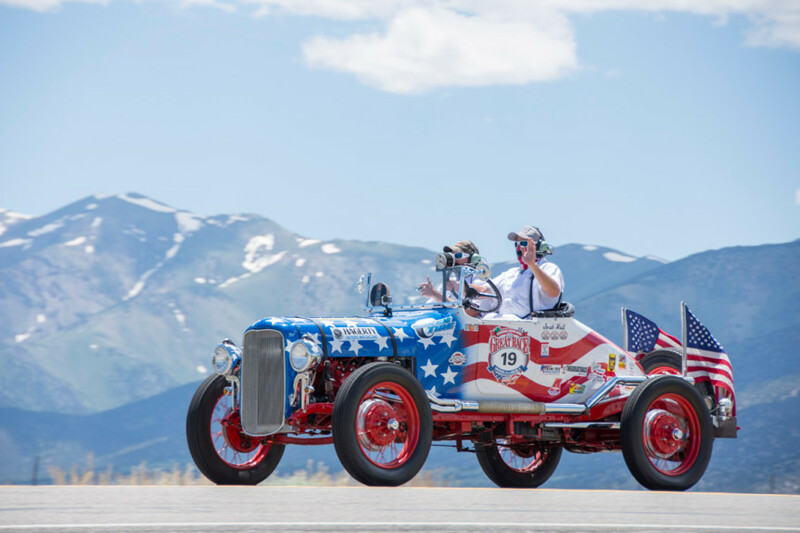 A 1916 Hudson Pikes Peak Hillclimber, a 1916 Hudson Four Passenger Speedster, a 1916 Chevrolet Phaeton, a 1917 Peerless Racer and a chain-driven 1918 American LaFrance Speedster are the oldest cars scheduled to be in the 2017 Great Race from Jacksonville, Florida, to Traverse City, Michigan. The 2018 winners will again receive $50,000 of the $150,000 total purse. Great news! Saint John, New Brunswick, is one of our international stomping grounds…having lived there for 7 years. And our Support Crew, Lloyd and Linda Hodgin, call New Brunswick HOME. It appears the chances are “good” of having their great support once again, in 2018!!!! Yippee! I need to get my Passport up to date! I’m excited. might have to build a car real quick for this one…. Really,you better get started, and I ‘ve been told by one of the sponsors thae the 120 positions have been filled, good luck though. It was a great race car and is a fun driver. I have charts etc. that we used in the race. I went to college in Buffalo and used to love going to the pub and later the Museum. Marking this on my calendar! What’s the chances a freshly retired airline pilot join the ’18 race? I have a couple really dependable old rides just waiting to get out on the road !!! as a former fighter pilot, I can promise that you would love it…not exactly an inexpensive event…. navigator needs to be a math wiz….driver needs to stay spot on airspeed…the event is wicked fun from start to finish… a low maintenance car is a plus..there a couple of shorter events around the country that can help you get ready. Happy to answer any questions. Where would I go to find these smaller races before the Big One? Where can I see other event dates??? I am VERY interested in getting involved. I have nothing but the desire to be in this event. I am David L Stringer. I would like to share my thoughts with you if you are looking for a co-driver. Call 3174124513 or text and or email my @ [email protected]. Just think chicken wings in Buffalo, fiddleheads in New Brunswick, lobster in PEI and maybe a chance to meet Anne of Green Gables all in one trip! 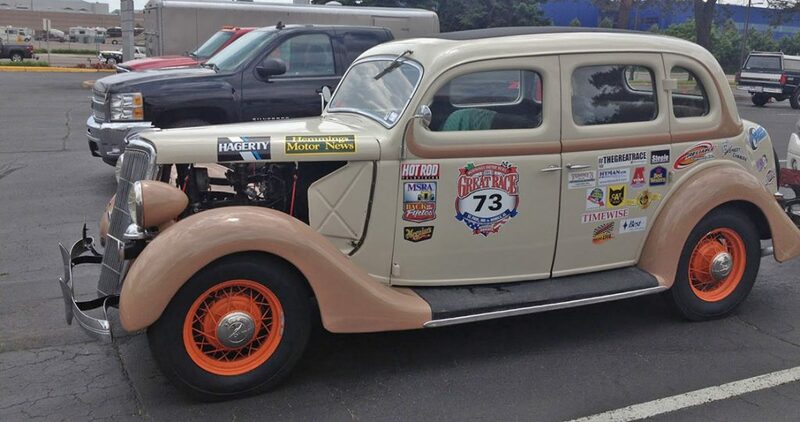 We (Dana Fraser and myself) were participants in the 2016 race with my 1936 Phaeton Ford. As you may recall we had a lot of over heating problems as well as a generator issue. We have restored the car and are ready to compete and give it our best effort again. I know we are too late to get into this years race but please save me a spot in the 2018 race. correction! It was the 2015 race that we participated in, not the 2016.
do cars have to be stock or are modified cars with more modern engines, trans allowed. Are all spots full. Reg. Fee ? Bucket List Dream! Please get me a spot for 2018 or 2019! Have the perfect car! I just learned I have a buddy racing in the event . I have been very active in promoting and videotaping and photograph of Motorsports Events across Canada for over 25 years GO VIDEO MOTORSPORTS on Facebook and Glen Orth on Facebook . I was a rally navigator as a teen. Now organizing an event commemorating the 1903 Automobile Endurance Run which ran 800 miles from NYC to Pittsburgh, through Buffalo and the Catskill Mountains. I want to create an Automobile Heritage Trail along the 14 NY Counties they crossed in 1903. On September 23rd 2017 we held the first Catskill Conquest Pilot Rally over a 90 mile section of the 1903 route through Ulster and Delaware Counties along the Catskill Mountains Scenic Byway. I have a presentation to offer on this historic event and spend the Summer in Nova Scotia, so hope to connect with the Great Race at some point. Hope they travel the Cabot Trail on Cape Breton Isl. What a great opportunity to showcase Buffalo New York. I live outside of Buffalo,in Lewiston, New York and I will mark this on my calendar to be there on June 23, 2018 to see the start of this event the great race awesome. Perhaps there is an error on the 2018 route map on this website. It does not show the race going to Prince Edward Island. looks like a great event am looking forward to its arrival in Halifax. If there is any assistance required from our end of the tour please do not hesitate to contact. We are a well organized British car club with membership of 265 and vehicles totaling over 450 throughout New Brunswick,PEI, Nova Scotia and New Newfoundland. What a great event to use your vintage car in , I have added this to my bucket list ,maybe for 2019 . Time to start looking for a nice dependable old ride. My wife and I would love to enter as participants in this race! We are restoring a 1966 Ford Thunderbird. Please let us know the details on how to apply! Although the above mentions our Province of Prince Edward Island, your route map bypasses our tiny province, Canada’s smallest.. Your people just can’t miss a trip over the Confederation Bridge, the longest bridge over ice covered waters (winter). To parade your vintage cars around the Charlottetown Driving Park (1888) in front of thousands of Islanders. Trusting your route map will be corrected and will include PEI. Don, did u hear back . We they be coming to PE. great news race coming to Nova Scotia. i am just finishing 1930’s single seater dirt track car . wont be ready for canada day sorry to say. this will be very popular here i am sure. will attend in 47 ford with as many old car nuts as it will hold ! please email if you are proceeding past halifax on the 101 toward Yarmouth ferry to Portland Me. perhaps i could help with stop overs etc. chris in Berwick just off 101. Saw them today driving through Ira, Clarendon Springs and West Rutland, VT. It was awesome to see all the cars today in Warren Maine about 1pm. Several people using the wonderful shade that my trees provide. Ed and Steve Tourje’, you can do better. Good job so far. Let’s close the gap. This is your year. Let’s go, Stella II!